On Tuesday, April 2, 2012, the Sigma Pi Sigma National Office received a letter with no return address. Inside was a handwritten note (figure 1). Taped to the piece of white paper was a Sigma Pi Sigma key (figure 2). But this important Sigma Pi Sigma insignia was clearly from the past. This key was old. It was not made from the same golden-colored alloy as the Sigma Pi Sigma insignia pins donned by new initiates. The metal was tarnished, and the sharp edges had been smoothed. The staff in the Sigma Pi Sigma National Office faced an interesting mystery. In an effort to discover the origin of the key and locate its owner, the text of the letter and a photo of the key were posted in the Sigma Pi Sigma and the Society of Physics Students social media channels. Facebook and LinkedIn chatter prompted a search on eBay for Sigma Pi Sigma artifacts. The reports were that sometimes interesting historic Sigma Pi Sigma memorabilia could be found there, offered up for sale for interested collectors. We found this to be true. We found and purchased a photo showing attendees of the 1962 Sigma Pi Sigma Congress, an addition for our archive. Another key, similar to the one received, was also available for purchase. In the ad, the general description of the object included a note that the back of the key bore an engraved name and school. We purchased that key and hurried to remove the tape from our mystery key so that we could inspect its back. The key anonymously mailed to us was most certainly the induction key given to the 26th member of Sigma Pi Sigma ever to be inducted. But who was William Nelson Mebane, Jr.? After sharing with Mr. Mebane that we had received his grandfather’s Sigma Pi Sigma key in the mail and would love to return it, Mr. Mebane was kind enough to share more about his grandfather. William Mebane, Jr., was called into service from his position at Davidson College to work on a secret project in Manhattan. “During this time nobody really knew what he did, but, based on the mailing address of the lab in New York, we think he worked on part of the machinery for the detonating device on the atomic bomb—he probably didn’t even know,” his grandson commented. 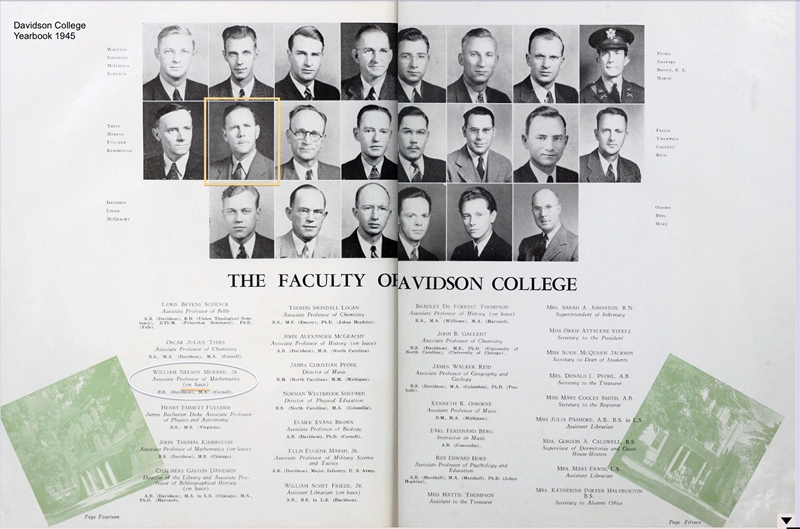 Davidson’s 1945 Quips and Cranks lists him as associate professor of mathematics on leave. Could he have been at one of the labs as stated by his grandson? 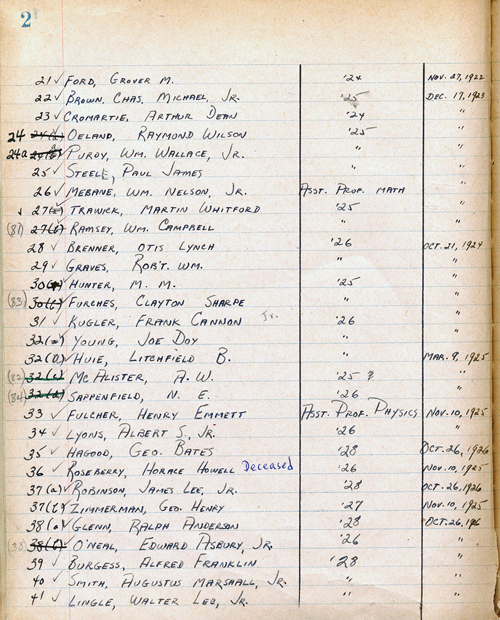 The archives of the Manhattan Project housed at Columbia University include a folder with documents with his name. Although the contents are restricted, Columbia’s university archivist could confirm only that he did work for the National Defense Research Committee (the organization that managed the secret research that, among other projects, developed the atomic bomb), but not where or what he did. Mebane returned to Davidson after the war. It turns out that there are four generations of men named William Nelson Mebane, and all four attended Davidson College for various periods of time. 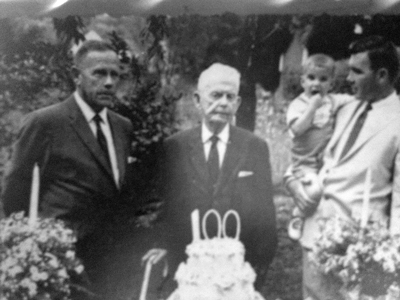 William Nelson Mebane, Sr., returned to Davidson at the age of 98 to complete his degree. Science also seems to run in their blood. The afore-mentioned grandson, Bill Mebane, is a marine biologist who founded the Sustainable Aquaculture Initiative (SAI) at the Marine Biological Laboratory in Woods Hole, Massachusetts. The initiative promotes sustainable fish farming to feed families in Haiti. William Mebane’s key returned to its alma mater when Sigma Pi Sigma Director Dr. Toni Sauncy presented it to the Davidson College chapter at its 2014 induction ceremony. 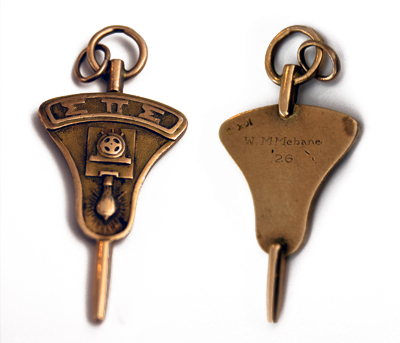 Both Mebane’s key and the one purchased on eBay are fascinating pieces of Sigma Pi Sigma history and proof that history can emerge in the most unlikely places. Our past as an honor society is rich and full of stories and connections. Tied together by a common interest in physics, Sigma Pi Sigma’s members are diverse and have contributed substantially to a wide variety of spheres. As we celebrate this induction season and welcome hundreds of new members into our society this spring, let us also remember and thank the many great individuals who have brought us to where we are today. As the custodians of the society and its traditions, we at the Sigma Pi Sigma National Office are always eager to learn more about those individuals. We must express our gratitude to the anonymous sharp-eyed person who started this whodunit story by spotting the key and sending it to us! And to all our readers: if you happen to come across a piece of Sigma Pi Sigma’s past, send us a note! You never know where it might lead . 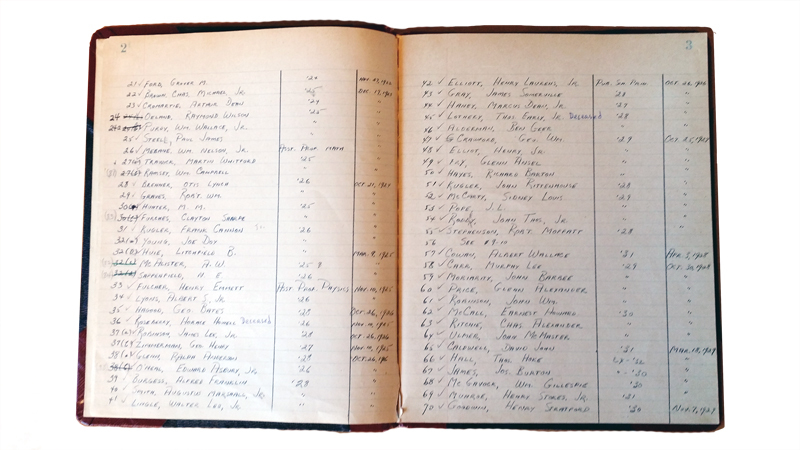 . .
1Each Sigma Pi Sigma chapter keeps a historic record of all its members in a book with red covers (the “Red Book”). Each new member signs the chapter book at the induction ceremony. The National Office keeps a copy of each Red Book in which staff members enter the information as submitted by the chapters.